Title: Fugue from Piano Sonata No. 29 "Hammerklavier"
Beethoven’s famous Sonata Op.106 in B-flat Major, called “Große Sonate für das Hammerklavier”, is perhaps his greatest piece written for piano. Its last part, the Fugue, completes the enormous Sonata and, of course, “crowns” it. Beethoven was an excellent pianist in spite of his being deaf, and he was likely the only person in Vienna able to play this Fugue. The Fugue herself, I suppose, contains all things that may belong to to a perfect Fugue. In other words, we have to approach it as a kind of self-examination. Self-evidently, such a Fugue needs a special introduction too. This will be a way to walk along most of the “Circle of Fifths” with some little visits in tonality. Two “Doorways” in F and A have to be passed: these are the first two tones of the theme of the Fugue. This theme is one of the longest that I know of. Its head consists of three tones, a decime-jump upwards into a leadingtone-thrill and resolution into the octave. Then three motifs going thirdwise downwards lead into the “dragontail” also in three wavings. The theme then through a lot of changes, so in meter, in tempo (augmentation), in reverse flow of time, (from Beethoven treated extreemly carefully, p sempre a.s.o.). The most dramatic moments come from meetings of up- or down-going decime-jumps, especially when coming nearer and nearer (we call this “Engführung”). Further the way goes through: inversion with increasing struggles to a sudden general pause, introducing moments peaceful, calm and soothing. Then again appears the theme with a premature ending: catastrophe! Consciousness recovers for a strong resolution: in real unison (in three octaves) six times raising chromatically, the head of the theme and the end. P.S. Bar 323 to 333: what little story are the three voices telling us? To show the amazing life of the three voices, now substituted by real self-responsible musicians as clearly as possible, I tried to preserve these large intervals as much as I was able to do. 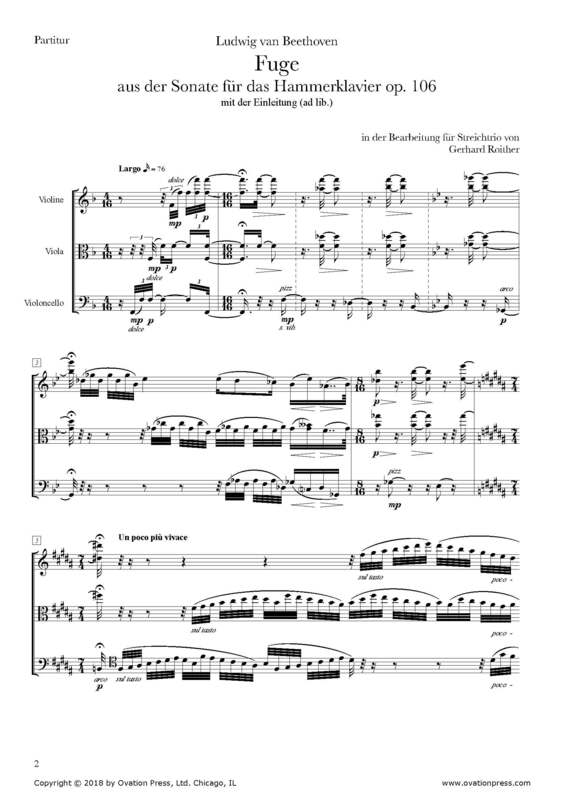 So, I thought to be able to lift the essence, perhaps the idea of the Fugue out of the connection with the “Großen Sonate”.